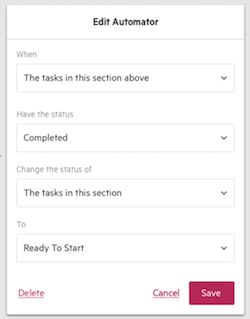 Tasklist Automators allow you to apply ‘if this, then that’ rules to task sections in your work items and templates. Tasklist Automators allow you to apply ‘if this, then that’ rules to task sections in your work items and templates. The status of tasks or a work item can be set to automatically update based on what happens to other tasks. These Automators are added to the section level of your list of tasks. 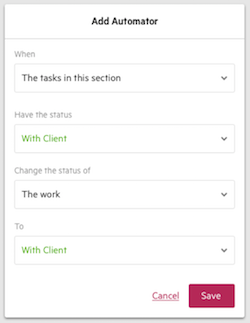 They can also be added to Client Task sections, and you can add multiple rules within the one section. The process for adding an Automator here is the same, whether you are adding it to a work item or a template. From the task section options menu, choose Add Automator. The Automator you create will 'listen' for activity that happens. When the event that you set happens, the rule will trigger. All your primary statuses (Planned, Ready to Start, In Progress, Waiting and Completed) will appear here. Note: custom workflow statuses will appear here when you choose "The Work"
All your primary statuses will appear here. All primary and custom statuses will appear when you are changing the work. Once you have set the Automator, it will appear at the top of that task section. Once you have created your Automator, you can click on it to edit it. How do you know when a tasklist Automator has triggered? When a tasklist Automator has triggered, it will appear with a 'strikethrough'—with a horizontal line through their center. If there are still tasklist Automators within that section, they will remain without a strikethrough. A tasklist Automator can only run once, which means that you can't untick it after it has already triggered and expect it to run again. In some circumstances, if you move a task section containing an Automator, the Automator will become invalid. For example, if you move a section to the top of your list that contains an Automator with the rule "When all of the tasks in the section above..." it will not have any tasks above to look for. In this case, the Automator will become inactive, and it will appear with an error message.